Publishers are less keen on trying to bundle multiplayer with its games, and an analyst thinks consumers aren't too worried about it. It's not uncommon to see multiplayer included in major retail releases. It can be a costly design decision, though, given the considerable budget dedicated to developing a solid multiplayer mode along with the core game itself. Electronic Entertainment Design and Research (EEDAR), a videogame market research firm, has found that the industry is gradually shying away from multiplayer, and more games are shipping without it. EEDAR examined every Xbox 360 and PlayStation 3 retail game in the US since 2006, and discovered that the percentage of games shipping without multiplayer rose from 24% to 41%. Conversely, about two-thirds of games released in 2006 came with online multiplayer; that figure dropped to its lowest in 2011 at 38%. 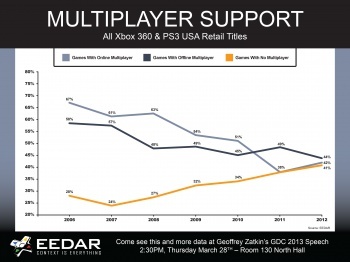 The presence of offline multiplayer modes also dwindled, falling about 15% over six years. Geoffrey Zatkin, chief operating officer of EEDAR, tells the PA Report that well-executed multiplayer can be "the heart of the game", with several games providing best-in-class multiplayer like Call of Duty, Halo and FIFA. However, he also notes that the costs of developing multiplayer (if included) aren't necessarily offset by increased sales of the game. Zatkin adds that the game may not even benefit from the inclusion of multiplayer in the first place. "Multiplayer is a game feature, and not every feature belongs in every game. Including multiplayer for the sake of having multiplayer doesn't make sense. Multiplayer should be included because it makes the game better," he said, citing several successful games that were focused on a single-player experience, such as Batman: Arkham Asylum, Skyrim, and Fallout 3. Even though more publishers may be cutting online multiplayer from its games, Zatkin believes that consumers are not particularly worried by the trend. "I don't think that players are noticing," he said. "I believe that people want good games. I don't think any single feature makes every game more fun; putting in a 'little bit of everything' often means that your game doesn't shine in any single area. "A game that gives you a great experience is what you want; if the great experience involves multiplayer, fantastic. If it doesn't - well, that can be fantastic as well."